In all the Wii U commotion at E3 this year, Link's next and final outing on Wii was rather lost, but we were able to reconnect with the Hero of Time at a recent preview event in the UK. 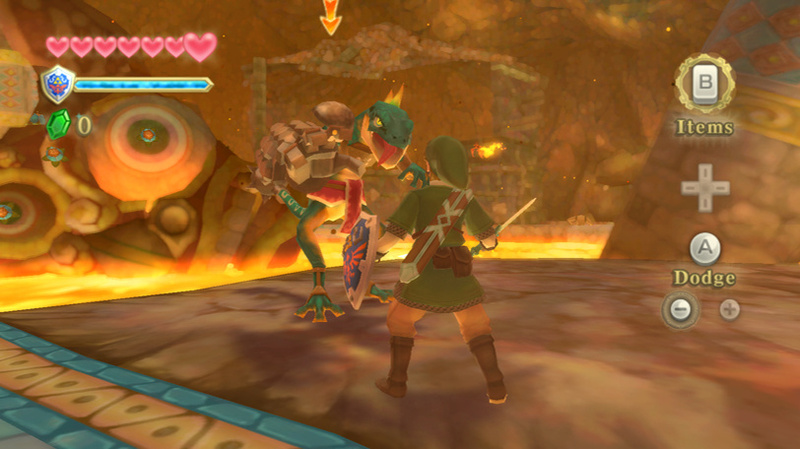 Three levels in total were playable: an aerial bird race, a dungeon and a face-off against Lord Ghirahim. With Wii Remote Plus in hand we set off to see if Wii's final big game will send the console out with a bang. Jumping right into the dungeon, it doesn't take long to adjust to MotionPlus controls and the game smartly throws a few weak enemies at you with weak spots that can be exploited with full sword control. Spiders can be flipped over with a slash from low to high, then stabbed in a purple spot on their underbellies, with wild sword swinging often getting you a very tight squeeze from the eight-legged fiend. The Stalfos miniboss is also overcome by smart swordplay, or Jimmy Fallon-style flailing. Swapping between items is easily done too using a neat circular menu: rather than pointing to the item you want, you tilt the controller in that direction and tap a button to select it. The classic items — bombs and bow — function very much the same as in Legend of Zelda: Twilight Princess, but the beetle and its upgrade show off the extra accuracy granted by MotionPlus, tilting and twisting the controller to guide the beetle through the air towards switches, items, enemies and more. No doubt this particular item will come in handy for plenty of puzzles in the finished game. Stabbing works well. True story. One of the biggest changes has nothing to do with MotionPlus, though. Pressing A no longer makes Link roll; instead, holding the button now lets the hero sprint, something we're surprised Link hadn't figured out for himself long ago. You can only dash for a short while but it makes a big difference, and means the days of rolling through large spaces to go faster are truly over. It also makes it far easier to clamber up stairs, blocks and ledges, without Link getting a sore head from bashing into everything around. The playable demo was limited to 15 minutes, nowhere near enough time to see everything the dungeon has to offer, but the combat felt enhanced by the addition of an extra dimension to the sword, and we can confirm the game is perfectly comfortable to play while sat down. Stood up is better of course, but we were able to overcome the challenge while sat on a stool, just as well considering the length of the full game. Battling against Lord Ghirahim played much the same, a combination of Wii Remote mastery and spacial awareness that typifies many bosses in the series. You can hold the controller above your head to charge a powerful attack, though we found it just as easy to use the Nunchuk to shield bash when appropriate and let him have it from there. Lastly we took flight with a bird chase from an early part of the game. Here the aim is to chase and catch a brightly coloured bird on your own feathered steed, shaking the Nunchuk to flap your wings and maintain altitude, but in all honesty we didn't find it that engaging, feeling like a less interesting version of herding goats from Twilight Princess. Generally at preview events you know if a game is good when your time expires and you let out a sigh, and that was certainly the case with Skyward Sword. The controls benefit from MotionPlus but don't rely on it constantly: the swordplay hinges on it, but other elements feel like improvements on the methods established in Twilight Princess. Arguably the time for a revolution in Zelda control will come with Wii U, but based on this evidence, the next evolution will be up there with Link's best outings. Sprinting?! OK, this game will be better than OoT. Confirmed. I seriously can't tell you how many times before I got Epona that I wanted to go faster and got tired of Link rolling spastic-ally all over the place and screaming. Sprinting is all well and good, but can you still side-hop up hills at 60mph? Oh for goodness sake Nintendo, release this game already!! Also...Sprinting?! YES!! Oh my goodness you don't know how much I wanted this in a Zelda game...ABOUT TIME! But is there a pony to ride? Its good that you can finally sprint in a Zelda game and the rest of the game looks awesome. I am having trouble tempering my excitement and this article certainly doesn't help any. I hope the swordplay is as solid as most have been suggesting. Thanks for the preview. As usual, it sounds awesome. So is this the first 3D Zelda where Link does not roll? In this playable demo, was there the option to go to just a regular, non-motion control scheme? Or does anybody know if there'll be one? You can play a lot longer when you're not constantly throwing your body in motion. After all, I'm getting Zelda. Not Wii Fit. Not to mention my sensor bar tends to be off. The only thing I can see wrong with it so far is the bird deal. I hate having to chase s**t within a time limit. <_< The scenery looks great in the new trailer though. @11. You can be rest assured that since the game is designed around the concept of Motion Plus, there will not be an option to play without it. Still no voice acting huh? I guess when I finally get this game I'm going to have to party like it's 1998. They gave Samus a voice and the consensus was "BOOOOO!" so I doubt they'll do it for Link, possibly ever. @Mully: Giving Link a voice is impossible. He's not supposed to have a personality. This looks like it will suprass both TP and Oot in almost every way, and when you consider the quality of those games, that is definetly a good thing. @Mully For whatever reason Nintendo wants to keep fighting industry standards doesn't matter to me. I just think it's a shame. It's also fast becoming more important than ever for Nintendo to get the big name third party games on their next system. Somebody needs to do what Nintendon't. I'm still not a fan of the artstyle, but that may change when I finally play this game. Windwaker was cool, but...ugh. I can't stand the way this game looks right now. @yoyogamer: Well, I think it'll top them in every way that we've been shown so far. The thing is that they haven't shown what I consider the most important part: the world below the clouds. Skyloft is supposed to be like the great sea, though, so I guess that aspect is just as good as Twilight Princess. I'm kind of divided about the artstyle. I love the vivid colors, but I'm not sold on pretty much any of the character or enemy designs. Of course that was also the case with Wind Waker and it ended up being one of my favorites so we'll see. As of now, though, I'm not a fan of Zelda's different facial structure, Link's pouty lips, some of the enemies (Moblins look terrible!) or anything to do with the least intimidating-looking villain in Zelda to date, Lord Ghirahim. Why would I feel nervous about fighting a bad guy that looks like an anime version of something out of a 1980's goth club? "You can only dash for a short while but it makes a big difference, and means the days of rolling through large spaces to go faster are truly over"
So that means that rolling is completely out? A pity, but I guess dashing is also fun. 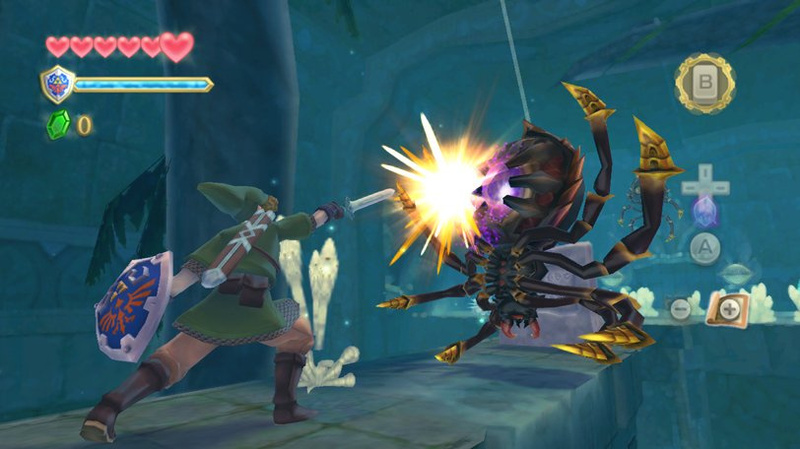 "Arguably the time for a revolution in Zelda control will come with Wii U"
Of course! What's more innovative then ditching Wiimote sword control, and throwing the items on the Wii u controller instead (do you smell my sarcasm?)? Why should Nintendo add voice acting if it makes a game worse/more annoying? Also, i'm happy that Nintendo doesn't follow the rest of the industry, since the rest are inferior to them. Skyward Sword does use the sensor bar, for the IR pointing. The bow, aiming the beetle, etc. I had my own preoccupations with the art style, but I gotta say, after playing the demo @ E3, all my concerns instantly evaporated. If you like Zelda, you will like this game. Simple as that. 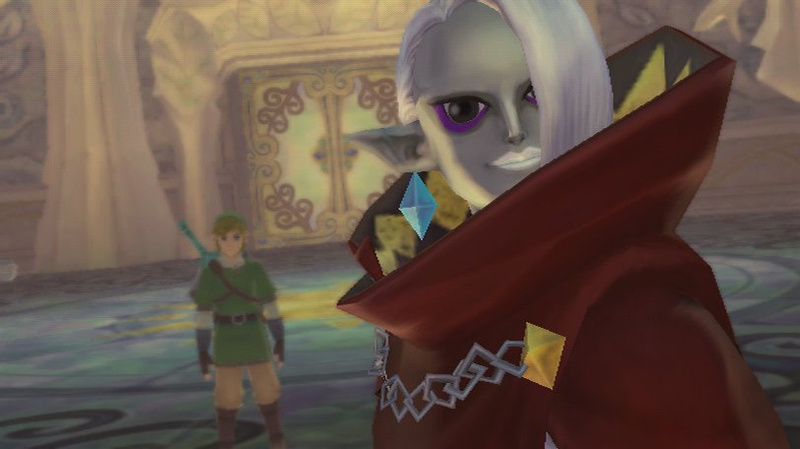 Wow, granted I have not been following this game as closely as you Zelda fanatics but oh my, this is my first time seeing Lord Ghirahim and it looks ridiculous! if the motion plus works, than i will probably try to do some dico moves more than once. "Hands-on once more with the Hero of Time"
Lord Ghirahim looks like Lady Gaga! It will be funny to see people getting destroyed by Ghirahim after underestimating him because of his looks. Sounds like it's shaping up nicely, but I hope the puzzles don't become too gimmicky, even the thing in one of the trailers where you spin the sword and make that one eyeballed door dizzy was a bit of an "ugh" moment for me. It doesn't actually. Choosing items and aiming is motion plus based. Hence there's no need for a fairy (or pointer) to be on the screen all the time like in Twilight Princess. Finally, a sprint button! No more headaches for Link! Twilight Princess was nine kinds of epic, even an emotional experience, as far as I'm concerned. The Tim Burton meets Jim Henson art design had a lot to do with it. I'm just not feeling it with this direction. I really think Shiggy was wrong this time. That, and it seems like a real shame to never see that robust world again, nay, a sin to never see Midna again! It's the little changes that make everything better. Finally no more A-Button mashing! Lookin' good. Can't wait to get my hands on this! @lockelocke: All of that is done with MotionPlus this time. @ Everyone saying Ghirahim looks ridiculous: From the E3 battle footage, I noticed he looks better in-game. Regardless of character design, his animations (body language, subtle gestures, particle effects, etc.) gave him a lot of personality, and his dialogue was good enough to convince me that he'll be the best villain in the series. All those factors that went into his character are incredibly well done. I'm really torn on the sprinting... on the one hand, awesome, since I hate being held back by Link's leisurely pace, but on the other hand... I almost consider the HUT! HUT! HAA! to be an essential part of a Zelda soundtrack. Anyway, is there an option to play left-handed? In the recent Game Informer coverage of Skyward Sword, they think Lord Ghirahim is a girl. I really don't know what to make of that. Either way, I'm going to get this game as soon as it comes out. This is going to be one of the best games on the Wii, though I'm not sold on it being a masisve reinvention of the Zelda series as I've been hearing. A damned good game probably, but not revolutionary. Great preview. Not here, but I like the Stamina idea alot. It should punish people who flail to win iirc. @Rift, I agree with what you said about Ghirahim. It's going to take a serious effort to take the crown from Ocarina Of Time. We will see. Windwaker was amazing, and the graphics in this game are as well. Don't know what everyone's hating about. Too bad Lord Ghirahim looks so terrible. I guess as long as the gameplay can make up for him/her then its not much of an issue. No more rolling is a good thing, but why press a button to sprint? Why have analog controls if you're not going to use them? @gamesake, well it's already tilt sensitive. And people always push it all the way in anyway, so this is just a way to add extra speed to the analogue. I think I heard somewhere that Zelda isn't a princess in this game. Reminiscent of Wind Waker, perhaps? @BetelgeuseWC77: I was thinking that, too, but this is before Ganondorf tried to get the Triforce. I hope Ghirahim isn't just a puppet. The series has already done that so many times, and I'd hate to see them cast aside another perfectly good villain. I guess it speaks to how overused that angle is, that the first thing a Zelda fan thinks when they hear of another villain is that they're being used by Ganondorf! But, I can't think of a console Zelda where someone other than Big G has ultimately been at the center of the plot. There's Four Swords Adventures with Vaati on GameCube, but I haven't gotten to play through it completely yet (guess I'll use it and OoT 3D Master Quest to get my Zelda fill until Skyward Sword). 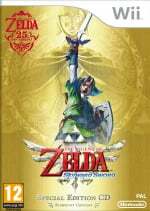 On a side note, I'm really looking forward to Skyward Sword as well because it'll be my first Wii Zelda! I got Twilight Princess on GameCube, since I couldn't afford a Wii when it was released (couldn't find a Wii even if I could've afforded it). @BetelgeuseWC77 Then think of Majora's Mask! I really wish they'd give us a release date for it. Looks awesome. What do you people think about the overworld? Do you think Skyloft is gonna be the 'main world' and you just jump down different parts in Skyloft to get to different parts in Hyrule? Or do you believe there'll be a whole world under the clouds that'll be explorable, in the likes of OOT and TP, just like Skyloft? I'm personally hoping for two overworlds with both Skyloft AND Hyrule and not just segments that force you to go up to Skyloft again after you've finished them. I want to be able to get to different places in Hyrule by walking or something too. @19Robb92 From what was said at E3 I'm guessing below the clouds Hyrule won't have an overworld anymore and will act as one big dungeon where you'll spend most of your time. Skyloft will be a hubworld or town area that you'll be revisiting a lot. "Hyrule won't have an overworld anymore and will act as one big dungeon (...)"
Hmm... I wonder if that means Hyrule will be one big connected landscape or if it'll just be kind of big segments of Hyrule you fall down to from Skyloft though. That sentence could be interpreted as either of the two.. It's just speculation. I'm personally hoping Hyrule does have an overworld. I also hope not too much of this game is spent flying Shoebills. It would be nice if Skyloft just acted as a HUB with a bit more exploration elements than previous HUBs in Zelda games. Then have Hyrule as the 'main' overworld. I could see it being a little bit like in Metroid, where it's nonlinear and kind of built like a labyrinth (which would make sense since it's a totally undiscovered land for all of Skyloft's citizens). Love everything about it. I just wish it would be the last traditional Zelda. Next one, on WiiU should be a major twist in concept. I think it's wrong to judge game by still image. The important is what it looks like in motion. Many companies are famous for twisting those images, like EA with Photoshop or Square for showing quite only cute scenes, and not actual gameplay. I think it looks great, and looks even better in motion. Anyway I'll make my final judgement when I'll have it in front of me. I think it's gonna play like Wind Waker with the world broken up into islands that you have to fly between. You've got to admit, that evil guy looks like a real sour puss. Each Link is a sort of spiritual successor to the "Hero of TIme" but, yeah, this is a prequel to OoT so the Hero of Time doesn't exist yet. Still, I don't play Zelda games for story, I play them for puzzles and adventuring/exploring. By all accounts this game is sure to rock and rock hard. It's unfortunate that because it's on a system that's all but dead, it won't get the accolades it deserves from anyone other than Zelda fans. Just look what happened with Super Mario Galaxy 2 when it came time to hand out GOTY awards. Superb game, maybe even the best of the generation on ALL platforms but it was still snubbed. Hope that doesn't happen here, but the Dudebros have truly taken over the industry, so it's pretty much garanteed. umm... what? The overworld in the sky IS obviously open, just like in the Wind Waker. It's just that there are some mini games (one, probably) to make you familiar with it before flying in the open. Oh I see. Well thats great news! Where did you read that? It's looking pretty tight so far. The combat alone looks leagues better than in Twilight Princess, I just hope at least some of the enemies put up a decent fight this time around. I hope this will be playing in my system this Christmas. Looks good graphically, imo. I just think the design of Link, & Zelda look bad. Actually, all the towns people look like GCN style graphics, but still, everything else aside looks good to me. Ganon(dorf) isn't in the game. The new villain's name is Girahim. I more and more get the feeling that Skyloft is the overworld, and that basically every area of Hyrule is a seperate level. So you fly to a certain island to trigger a portal to Hyrule, and when you enter that portal you land in a forest area with puzzles, a lava area with puzzles, etc. I really hope that Hyrule has a real overworld with a field, towns and all, but I fear that's not the case. That's probably the reason why Nintendo has almost shown nothing about Hyrule so far. Or maybe that is because Hyrule is totally mind-blowing and they want to keep it a surprise. I am hoping for the latter! Well, I think it's time to buy the Motion Plus u.u Also, reading some of the other comments I've got to say that TP has a real good art full of feeling and loneliness, guess I'll never forget the first time I enter to Twilight Realm (that was freaking amazing!). I'm not sure i trust this game much because I've seen the results of games where the makers have just said, ' hey look what our fancy controller can do. The A dash system seems a tiny bit strange although i'll admit it will be helpful if your walking around with no other means of transport. I TOTALY want this game! Just bought this to play on the Wii U. To have a good time before Pikmin 3 releases.